Located within the same building as Midlands 1-Stop, Georgetown City Hotel showcases its 2017 Ramadan buffet dinner this evening. This year's theme is Selera Kampung Ramadhan. Held at The Cafe, the dinner menu focuses on affordability. Unlike last year, this year's buffet is held entirely indoors. Ulam-Ulam (raw vegetables) is often served in traditional Malay meals. Vegetable choices include ulam raja (king's salad), daun pegaga (Asiatic pennywort leaves), jantung pisang (banana flower) and kacang botol (winged beans). Raw vegetables are typically eaten with powerful condiments like air asam (tamarind sauce), sambal belacan (spicy shrimp paste) and sambal kicap cili padi (bird's eye chili in soy sauce). Ikan kering (dried fish) is also available. As for kerabu (Malay salads), popular choices are Kerabu Betik (young papaya salad), Kerabu Ayam & Tanghoon (chicken & glass noodle salad) and Kerabu Taugeh & Kerang (bean sprouts & cockles salad). Other appetizers include Keropok (crackers), Papadom (Indian crackers) and Tauhu Sumbat (stuffed tofu). Kurma (pitted palm date) is also often eaten during iftar (breaking-fast) meals. Sup Kambing (Mutton Soup) is loaded with fatty chunks of mutton. The blend of spices produces rich taste, making the soup rather appetizing. Other staple foods are Bubur Lambuk (Malay porridge) and Nasi Briyani (Biryani rice). The Cafe has a grilling station where meats are cooked on a griddle. Meat choices today are sliced beef, lamb chops, chicken drumsticks and sausages. Overall, I am quite satisfied with the taste and general level of doneness. As for seafood, kembung (mackerel), pari (stingray) and kupang (mussels) are available. Grilled seafood works best with air asam. On the other hand, black pepper sauce is the recommended condiment to go with red meats. I love the fact that the black pepper sauce contains coarse bits of peppercorn. As for precooked dishes, Daging Rendang (spicy beef) is highly recommended. Beef is marinated with a blend of spices, and then cooked for hours until most liquid has boiled away. This rendang dish is cooked perfectly - further proof that you do not need to visit 5-star hotels to enjoy good food. Ayam Masak Ros (rose chicken) does not contain actual roses. The name refers to its reddish gravy, which comprises of tomato, dried chili peppers, kunyit (turmeric), lengkuas (galangal), halia (ginger), serai (lemongrass) and onions. As for Stir-Fried Black Pepper Prawns, I feel that the shrimps are not as crunchy as they ought to be. I recommend using fresher shrimps to provide juicier texture. Dhalca (vegetable curry) is a stew of eggplants, carrots and potatoes. Despite its vegetarian nature, I find this dish to be surprisingly appetizing. Other hot dishes during today's buffet are Braised Lamb With Rosemary Sauce, Fillet Seabass With Kerabu Sauce, Squid Thai Style and Fried Mixed Vegetables. One of this evening's highlights is Mee Ketam (crab noodle). The soup is very similar to Hokkien Mee, but uses flower crabs instead of shrimps. Yellow noodle (黄面), rice vermicelli (米粉), meatballs, hard-boiled egg, choy sum (菜心) and bean sprouts are to be blanched in hot water before being added to the soup. I feel that the soup is too salty for me, but otherwise this Mee Ketam is quite enjoyable. Rojak Buah (fruit salad) is a mixture of jambu batu (guava), betik muda (young papaya), sengkuang (jicama), nenas (pineapple) and cucumber. The cut fruits are typically dressed in thick shrimp paste. Ais Kacang is a popular Malaysian dessert. Diners can pick their own ingredients. Choices are attap chee (nipa palm fruit), cendol (green jelly noodle), cincau (grass jelly), red beans and peanuts. Shaved ice is flavored by coconut milk, gula melaka (palm sugar) and sirap ros (rose syrup). Ramadan dinners are incomplete without an assortment of sweet Malay Kuih. This evening, the selection of kuih is Kuih Lapis Pelangi (rainbow-colored layer cake), Kuih Bakar Pandan (pandan-flavored cake), Seri Muka (glutinous rice cake with pandan custard) and Cucur Badak (sweet potato balls with spicy fillings). In particular, I like the chewy texture of Abuk-Abuk. These glutinous rice cakes are filled with sweet coconut filling, while the outer surface is dusted with flour. Sago Gula Melaka is made from sago pearls. Soft and translucent, the pearls are dyed green for aesthetic appeal. Since sago is tasteless on its own, gula melaka and coconut milk are provided as sweeteners. In addition, the desserts counter also includes several types of cakes and fruit jelly. Also presented is Bubur Kacang Hijau Dengan Pulut (green pea soup with glutinous rice). Moving on to drinks, sirap bandung (rose-flavored milk) and soy milk are provided in dispensers. Hot coffee and tea are also served. Georgetown City Hotel's Selera Kampung Ramadhan is served from 30 May 2017 to 21 June 2017, between 7:00pm and 10:00pm. The buffet dinner is priced at RM55.00 net for adults and RM30.00 net for children. Senior citizens enjoy discounted price of RM42.00. 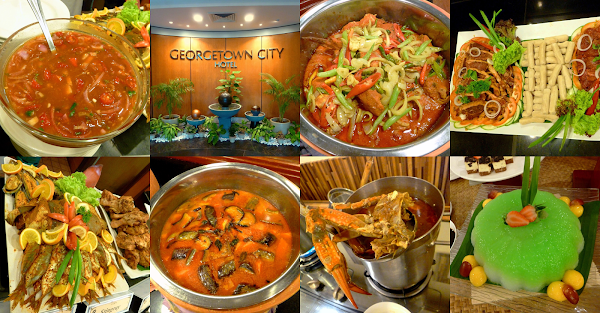 This is one of the most affordable Ramadan buffet dinners in Penang this year.